Located on Delta Dr near the intersection of Chelton Rd and S Academy Blvd, Extra Space Storage serves Colorado Springs residents near Southeast Colorado Springs. Locals will recognize our facility next to Centennial Elementary School and Big Lots. 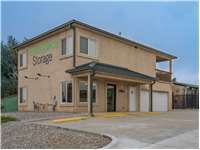 Do you need a convenient storage solution close to Colorado Springs Airport? Extra Space Storage is about 5.2 miles, so we're a great option for Colorado Springs residents and visitors who need storage units! Extra Space Storage on Delta Dr can accommodate both residential and commercial needs in Colorado Springs with a wide range of storage unit sizes, drive-up access, and exceptional security! Our Colorado Springs storage facility offers unit sizes from 5x5 to 15x30 with features like indoor access, drive-up access, and more. No matter what you need to store, we have the perfect space for you! At Extra Space Storage, we take security seriously. That's why our Delta Dr location utilizes advanced security measures like 24-hour video surveillance and electronic gate access. Drive-up access allows you to pull a vehicle up to your unit to unload and load items without hassle. It's the ultimate storage convenience! Some units with drive-up access can even be used to store small vehicles like cars and motorcycles. Drive-up units come in sizes 5x5 to 15x30. Extra Space Storage offers the best in the industry! From our clean, secure facility with top-notch amenities to our friendly, professional staff of self storage experts, we're dedicated to providing a one-of-a-kind experience for each and every customer. Contact us today to reserve a storage unit in Colorado Springs! The staff was very helpful. They answered any questions I had about the units and pricing. They made the process very smooth and easy. I would definitely recommend Extra Space Storage. The service and space have been exceptional so far. They take the time for you the customer. Information, explanation and great overall feeling when I left. I will refer them to everyone who needs storage for sure. Zach was the best! The customer service was very helpful, prices were affordable, and they found a unit close to home so we dont have to go far but the only thing is iblike have 24 hour access to my belongings and after 10:00pm you can not get on or off the unit. Great customer service and awesome price! The location for me was perfect! Office staff are amazing! They explain everything in detail and they'll work with you to accommodate your needs. She's the best example of excellent customer service! I will definitely recommend them to anyone looking for a storage unit. Facility is clean and secure, but do yourself a favor and get your contract in writing. I've had this on rental for less that 2 years and have 3 rate increases. Of course its due to supply and demand and they hike it up due to our military communities, as I am told. The rental process was easy and the facility is very clean. Well-lit at night also. Friendly office staff, not a pushy salesman, which was different from a previous rental experience I had with another company. We went to Extra Space due to the location originally. But when we went and talked to the rep he was great. He had a great attitude and sense of humor. He offered us several options but also recommenced which would be best for our situation. I would happily recommend Extra Space and use them in the future. I came to these guys with no clue how the storage world worked and they were fantastic. Never had any issues and the billing worked great. I would highly recommend using them if you're looking. The units were clean and secure and very easy to access. The staff is very friendly and has helped us when our code wouldn't work. The storage unit is nice and clean. I thing the cost is to high, they should lower it. They always are helpful and friendly when I have to stop in the office. It is always pretty clean in the parking lot now that they have found a solution to all the trash that used to accumulate around the dumpster. However, It is frustrating to have to get a key every time I need to throw things away. I will take that over an overflowing dumpster though. Security is pretty fantastic. I am grateful to know they take pride in protecting my stuff while it is stored there. Overall one of the best experiences I have had with a storage unit. Drive south on S Academy Blvd. Cross E Fountain Blvd and continue straight. Turn right onto Chelton Rd. Turn left onto Delta Dr. Our facility will be immediately on the right. Drive north on S Academy Blvd. Pass McDonald’s and continue straight. Turn left onto El Morro Rd. Turn right onto Delta Dr. Our facility will be on the left as you approach Big Lots. Drive west on Astrozon Blvd. Cross S Powers Blvd and continue straight. Turn right onto Chelton Rd. Turn left at Wendy’s onto Delta Dr. Our facility will be immediately on the right. Drive east on US-24. Turn right onto Chelton Rd. Pass Carmen Middle School and continue straight. Turn right at Wendy’s onto Delta Dr. Our facility will be immediately on the right.